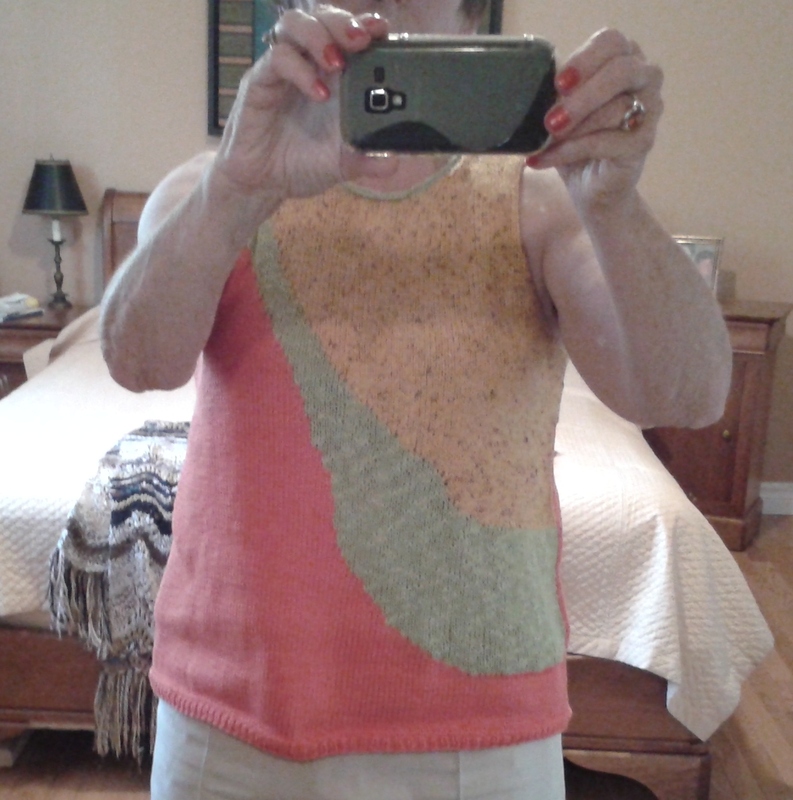 Sheer Panel Top, a pattern I first noticed in the Summer 2013 issue of Vogue Knitting, is finished. Two years from inspiration to completion. About average for me. Pattern: Sheer Panel Top from Vogue Knitting, Summer 2013 issue. Yarns: Coral - Super 10 Cotton. Green - Americo Cotton Flamme. Yellow - Cotton Tweed. It took a ball and a bit of the Super 10, all but a small amount of the ball of Cotton Tweed and about a third of a ball of the Cotton Flamme. The Super 10 and the Cotton Flamme were scores at last fall's Knitters Fair. I purchased them for $4 each. 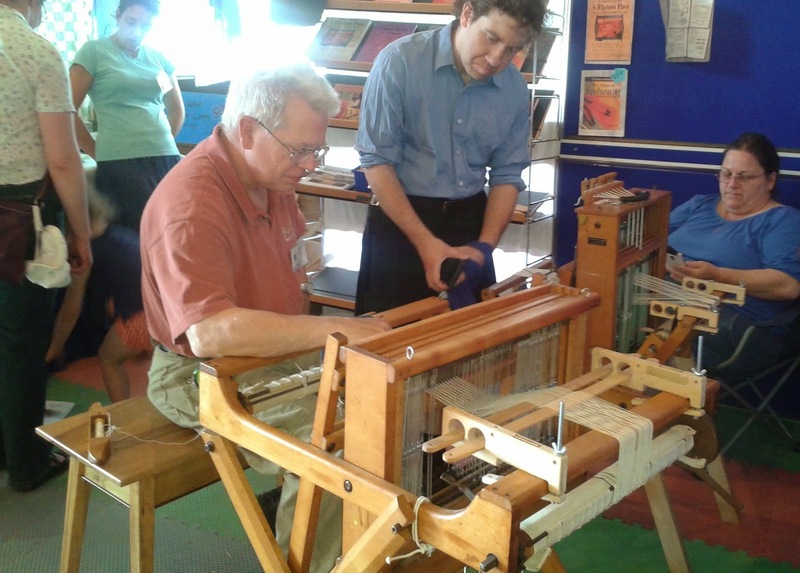 The Cotton Tweed had been a gift. No bank accounts were damaged in the knitting of this top. Mods: #1. 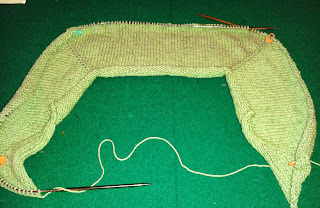 At the armholes, I continued to make decreases beyond where the pattern suggested stopping to knit straight. The idea was to better fit my 14 inch shoulder width. 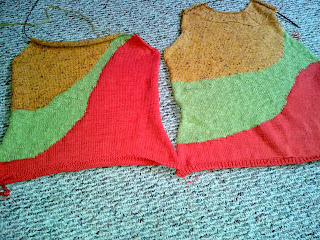 But - I neglected to account for the rolling under of the un-trimmed armholes, so now I have a bit of a racer style top. I like it still. #2. I wouldn't guarantee that the colour changes were worked precisely where the designer intended. 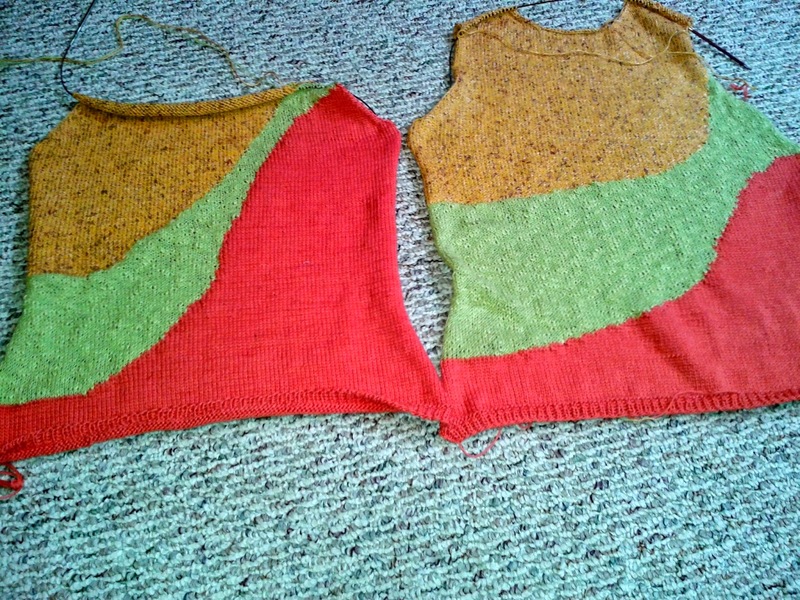 I knit this top a bit longer than my normal length, as it has a bit of an A line and is meant to drape and swing a bit. The Super 10, though, seems a bit stiff for the 'swing'. At least, in this new state, it is stiff. Hopefuly it will get more drape with wear. As always, the proof is in the wearing. I have worn it twice now. 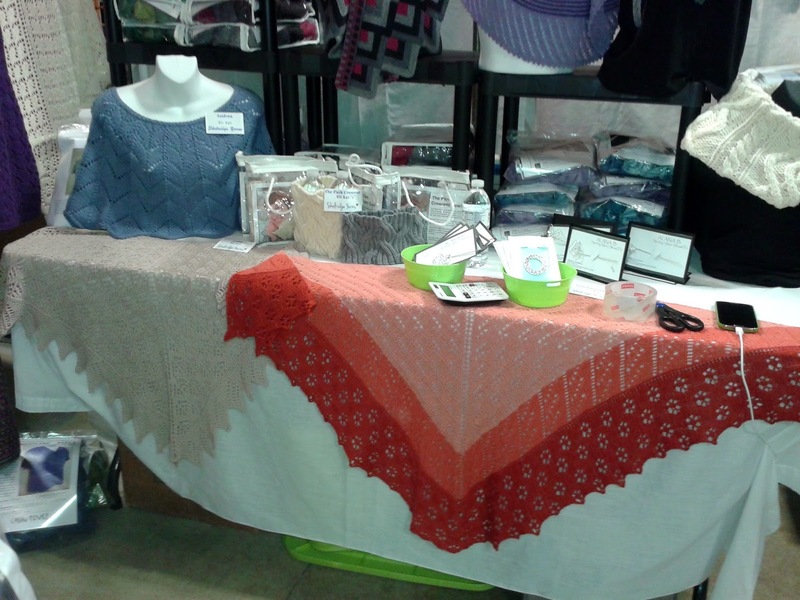 Yesterday, to knit group where it received many compliments. This morning, to the car dealership - my car needs brakes - where it went completely unnoticed. It feels good on though and that's the test. Travel bugs. That's what our knitters are. Doreen is in Trinidad, Deanna in Ireland and Sharon R in Paris. Sharon, though, has been keeping in touch. 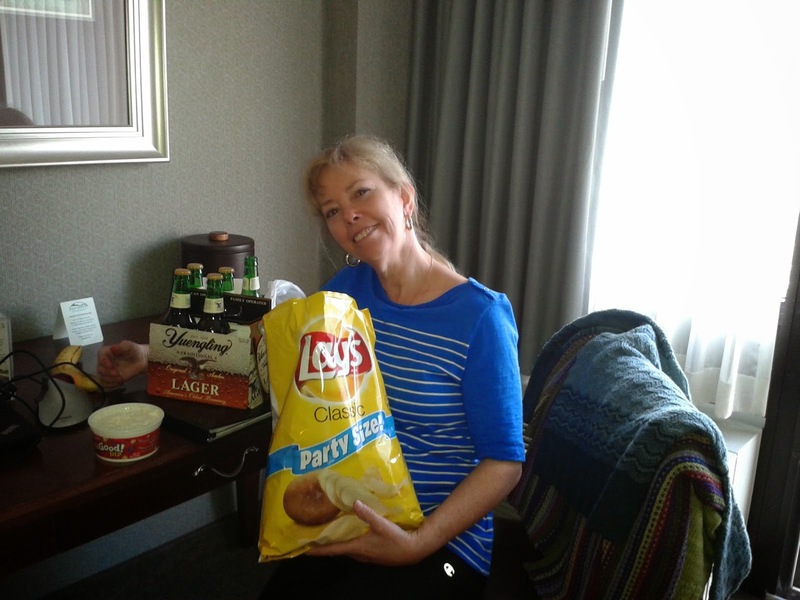 We know that she loves the food and purchased yarn and buttons at a Paris yarn store. 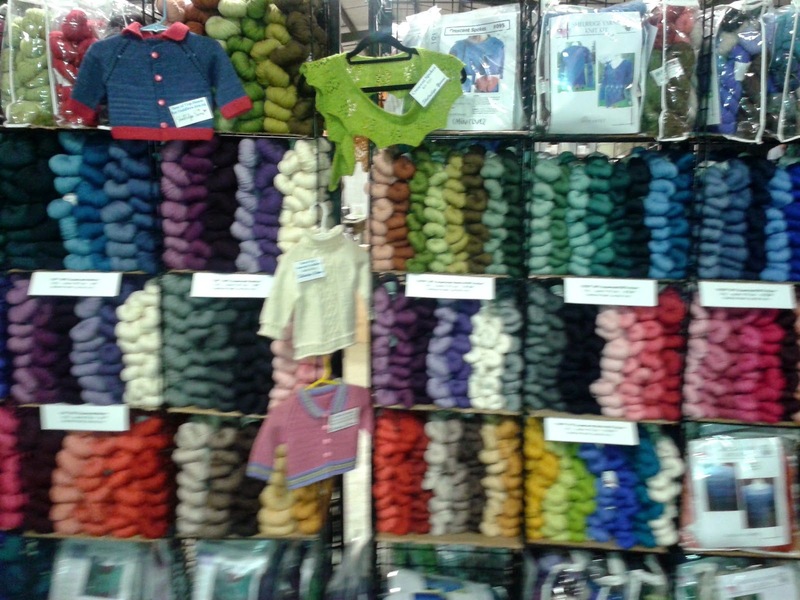 What stories that yarn could tell. She also sent us a photo of her Paris home. And if you look closely, you can see a picture of Sharon, taking the picture. She is reflected in the glass doors. 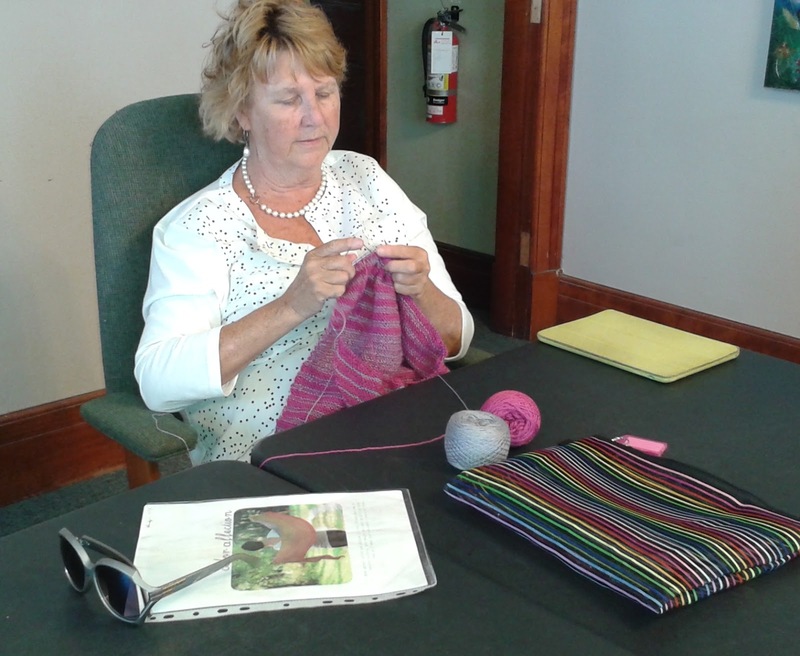 Those of us not travelling, knit. 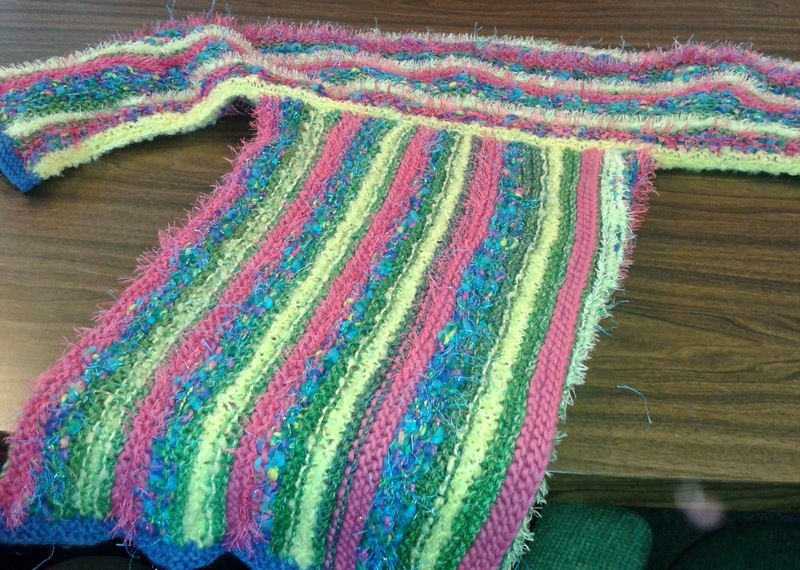 Gail has another section of her cabled sweater finished. 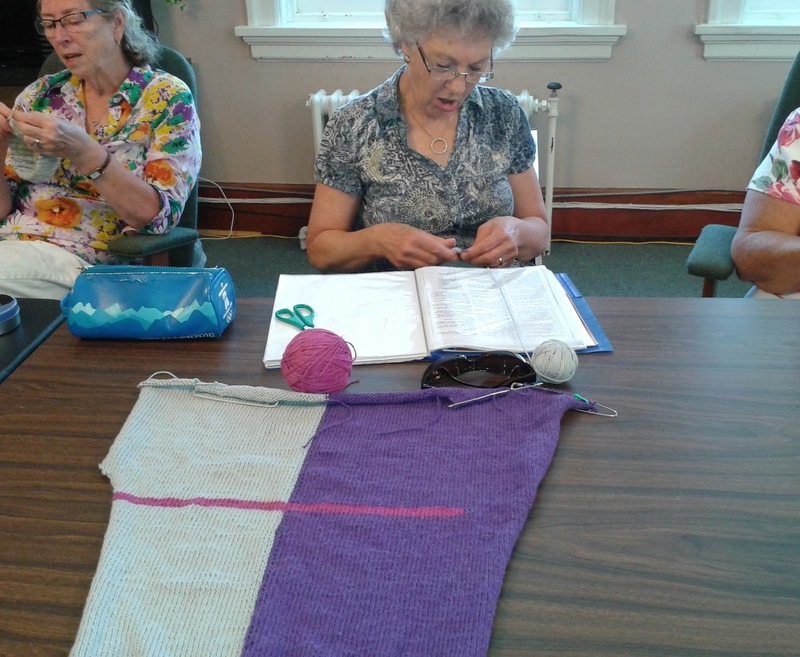 Every row is different, she says, requiring her to keep detailed notes. She is aiming for a fall finish. Both because she can see wearing it in the fall and because she doesn't want to take advantage of Colleen's - over at Riverside Yarns - generous return policy on unused yarn. 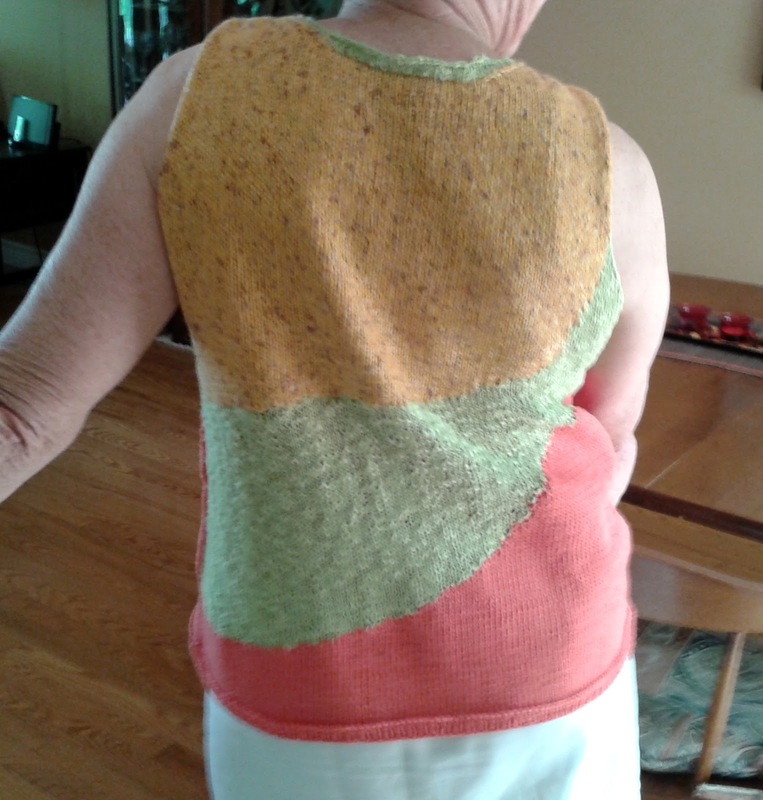 Wilma has finished the back of her little summer tee and is working on the front. I love the design. Wilma's pattern came from an issue of Vogue magazine I think. But the colour work is something that could be added to any tee pattern. 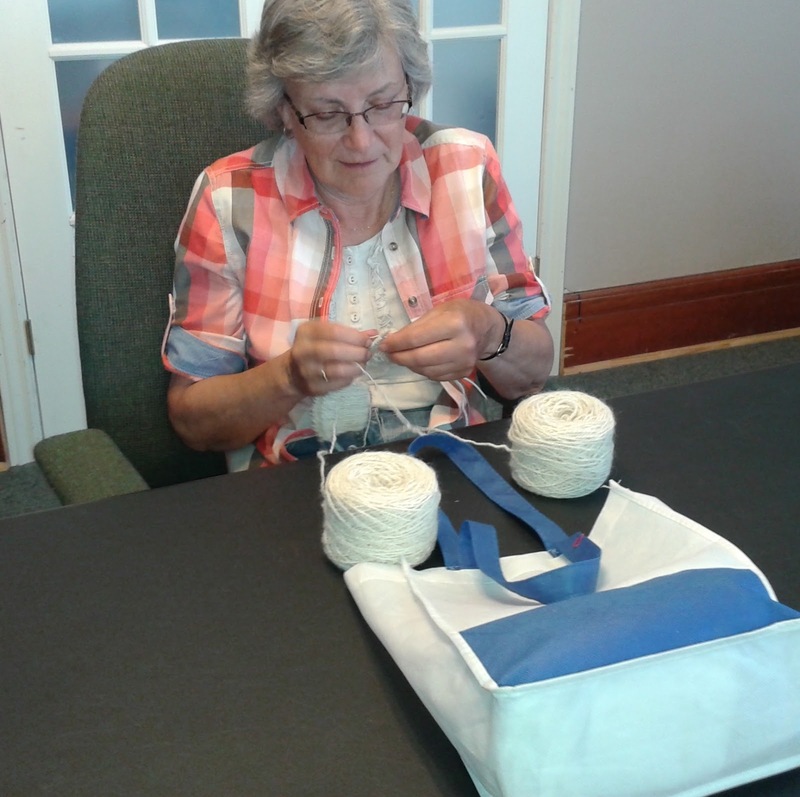 A busy knitter our Wilma has been. 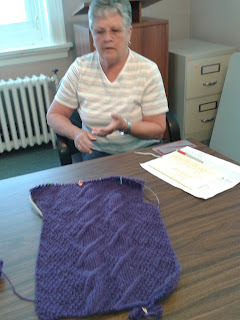 She also showed us a finished baby cardi. 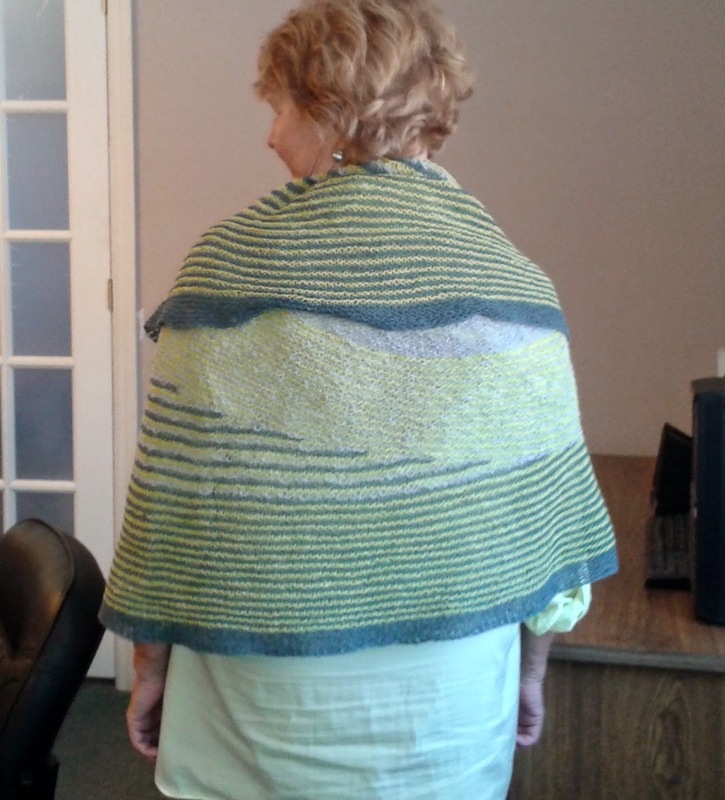 Smaller than she intended because she mis-read the pattern. She thought the second size was for 3-6mos. Instead, the second size was for 0- 3mos, the first being for a preemie. "Give a teddy bear with the sweater," Sharon advised, saying "if the sweater doesn't fit the baby, the teddy can wear it." Great idea. Sharon was knitting with some of her own hand spun. 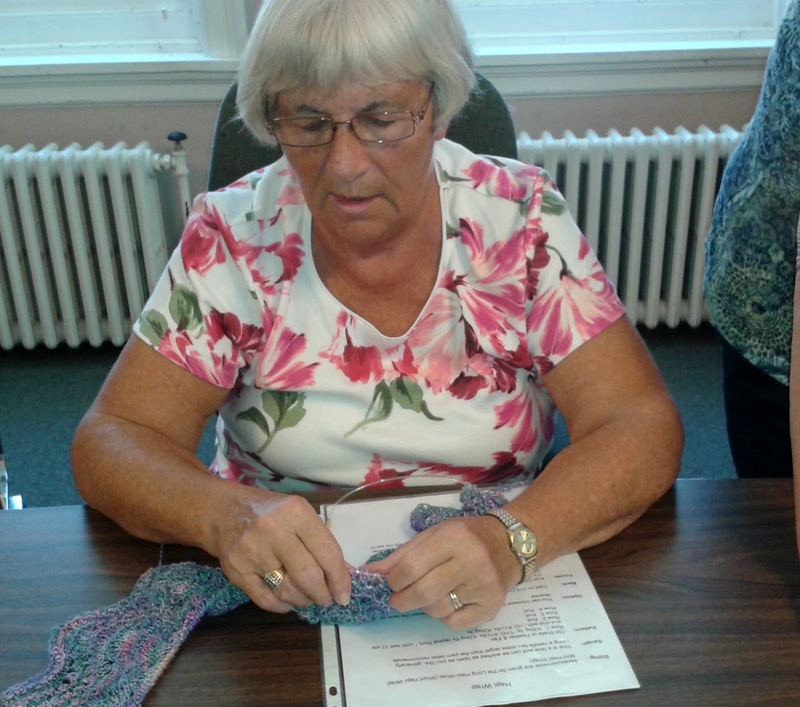 A thick and warm hat is what she is making. Jean too was knitting with her hand spun. 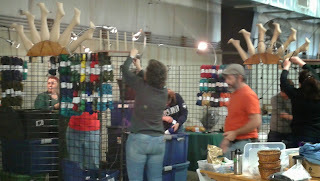 The yarn, containing mohair will be knit into socks. Socks knit on two circs to be exact. Carol has started a wrappy, shawly thing knit in the feather and fan pattern. The yarn is a very feminine boucle in shades of blues and pinky lilacs. Sandy B, who treated herself, this spring, to a VW convertible, rushed home, top down, from the cottage to get to knitting (hence the dishevelled hair, she says). She has another Colour Affection on the go. Speeding Grandmas in top-down convertibles are more likely to get tickets, Sandy. Sorry to say. And to all our travelling knitters - safe travels home. Remember, you can knit on planes now. After my Fern Poncho came off the needles, I returned to knitting Sheer Panel Top. It had been almost ready to come off the needles when I set it down to start Fern for my car knitting during the drive to Hearst last weekend. 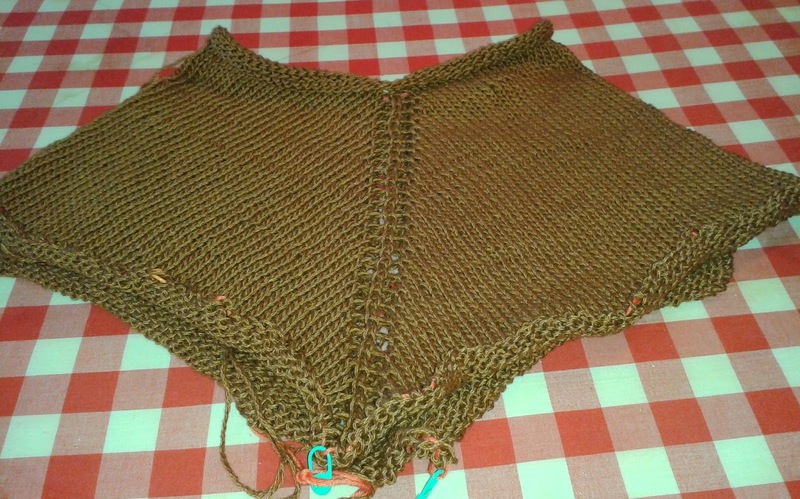 Sheer had only the front neck shaping to finish, which didn't take long. Last night, I pinned it to the blocking board and steamed it into submission and perfect shape/size. Well, almost. 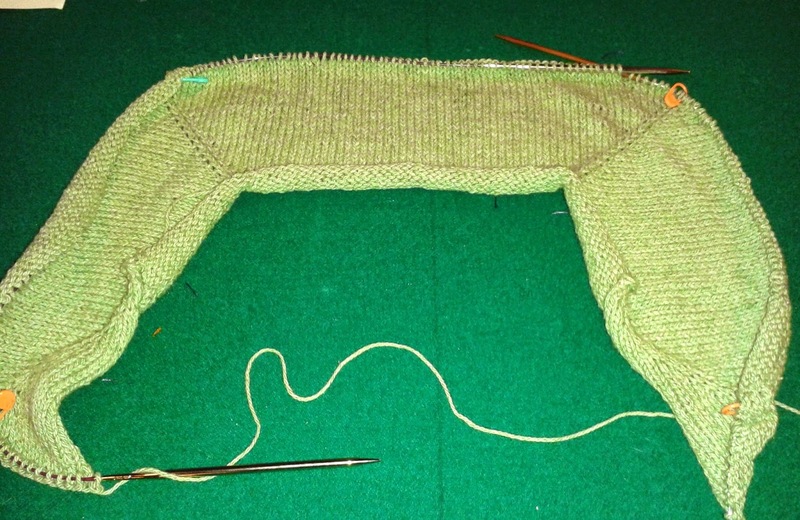 Since I had already seamed the shoulders it was too long to fit all of it on the board at once. But three-quarters of it was tamed. This morning, the untamed portion is getting its turn on the board. Seaming tonight, wearing tomorrow. Imagine! Two new FOs, two new wardrobe items to wear in one week. Such choices! My little, rust-coloured, cotton cover-up is finished. 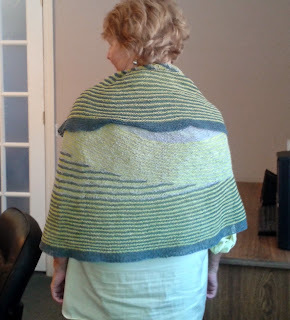 Since features from both the Very Harlot Poncho and The Fern Kerchief were incorporated in the design, I am calling mine The Fern Poncho. Starting with a cast on of 84 stitches and a 6.5mm needle (More stitches, but smaller needle than the V.H.Poncho) I used a Yarn Over increase on every other row to grow the poncho. I wanted the points of my piece to fall just below the waist and the sides to come to about my elbows. 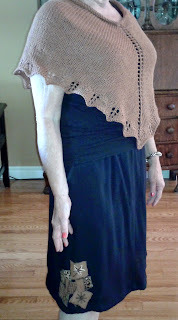 When the poncho was just short of that length, I worked the lace portion of the Fern Kerchief then cast off. To get the lace to work out as I envisioned took a bit of finagling with stitch count. 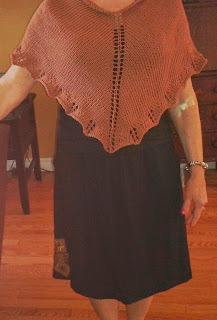 What I saw in my mind's eye was the center of the lace point immediately under the stitch between the two Yarn Overs. On both front and back. A few, hard to find - I hope - 'fudges' and I was there. 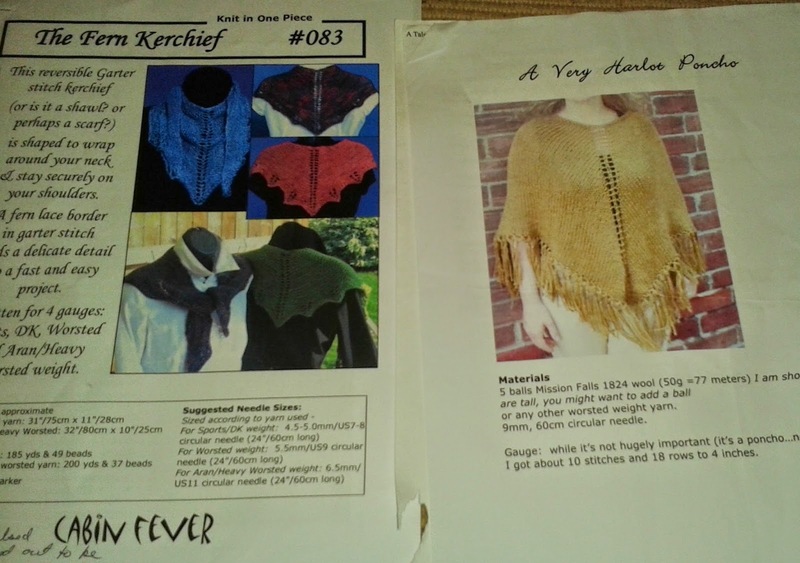 The pictures show the poncho being worn with the outfit that inspired it. A simple black 'tee' and a new-to-me black skirt. The skirt came from a thrift shop in Florida. 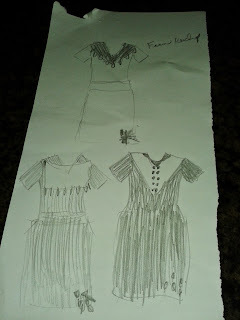 It was, when I purchased it, floor length with large squares of the rust and black African print all around the bottom. It fit but made me look like the broad side of a barn. I cut the skirt off at knee length and machine hemmed it. Then I cut a few of the print blocks into smaller blocks and positioned them in a 'tumbling block' arrangement near the side seam. This was my first attempt at re-fashioning a thrift store purchase. I can see now that I could have done better. With more and bigger blocks the look would have been more dramatic. But as a first attempt, I'm happy. I do think it makes a rather dressy summer outfit. 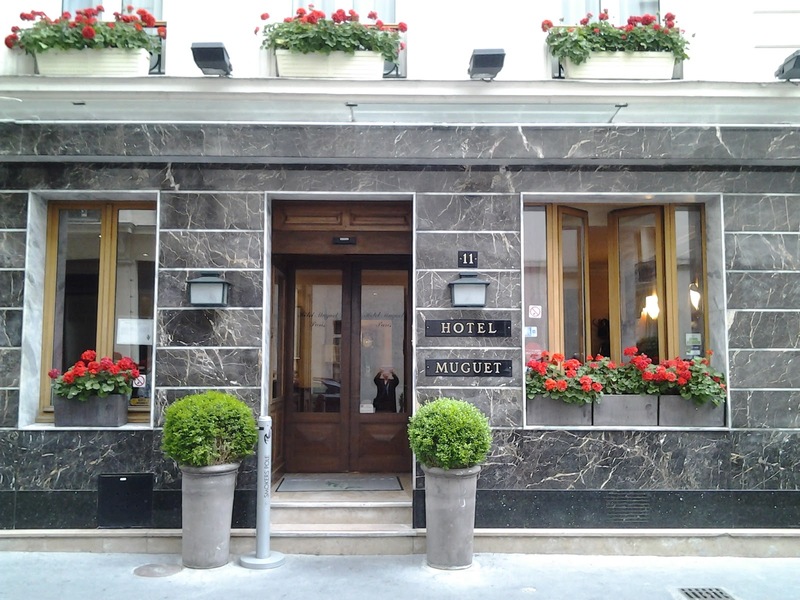 Total cost? Skirt - $3.69 - US dollars though; the poncho - yarn was a gift; the tee - purchased at Simon's in Quebec City for the bargain price of $10. Makes me smile to think of being able to look this good for under $15.00. Well, I think I look good. 20 plus hours of driving. Tons of socializing, visiting and getting caught up. Shopping with grand daughter number two, Abi, to buy her an appropriate outfit for the funeral (which she wore for the hour long service then tore home to change into sweatshirt and jeans). 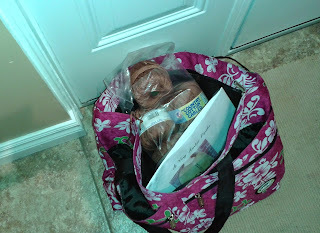 Picking up and delivering Sarah, our oldest grand daughter, from her out-of-town school. Experiencing once again the extreme weather that is Hearst - 26 degree heat and sun followed by 2 degree cold and rain. And now home again. 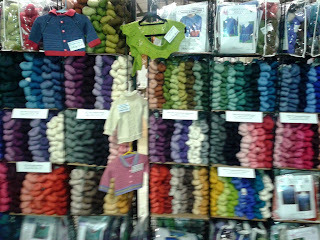 And how much knitting did I do in the 20 hours of driving? Here it is. 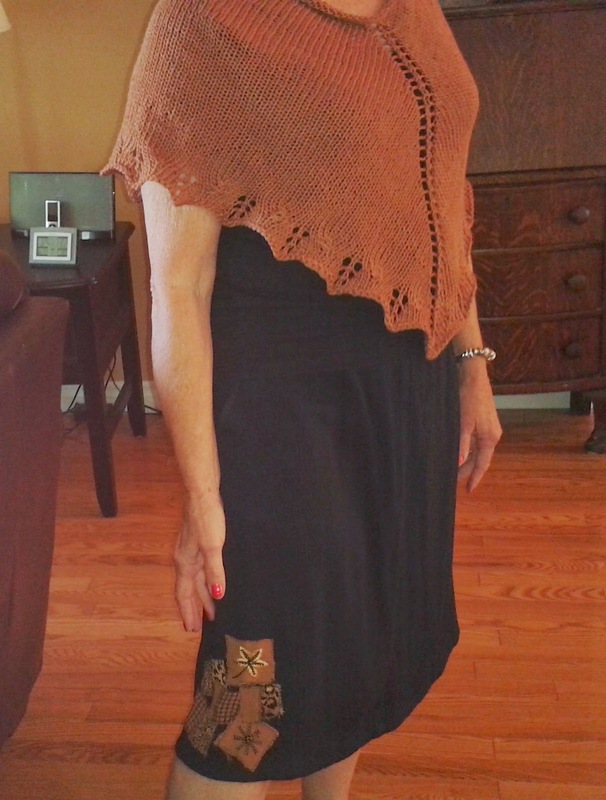 My little poncho to use as a cover up for my black outfit. Not yet complete but only a few inches to go. You are looking at the third attempt. 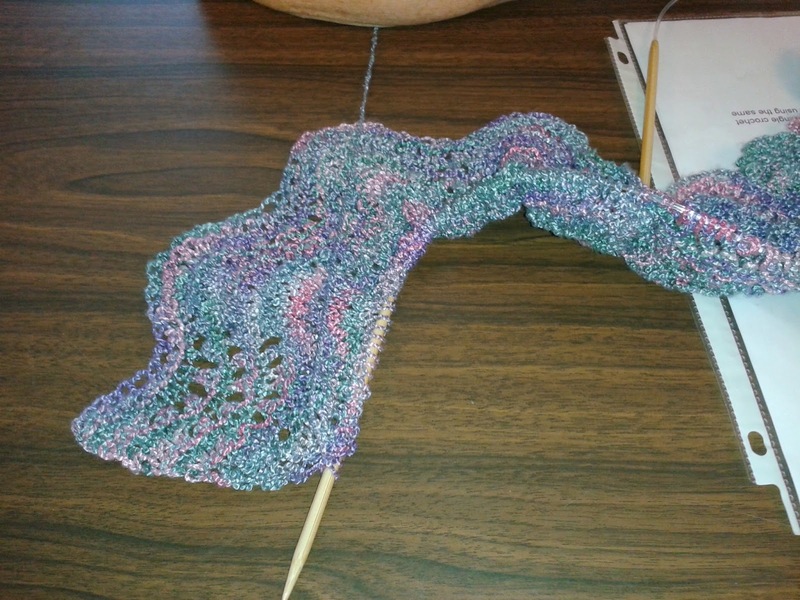 The first try, I cast on the number of stitches and used the needle size recommended in the Yarnharlot's pattern. I didn't like the very loose look. 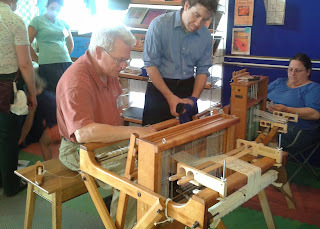 The Yarnharlot used wool and I was using cotton. 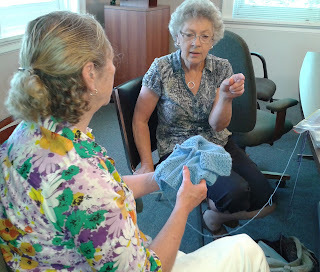 Those two fibres react differently to such loose knitting. The second attempt, I used a smaller needle - 6.5mm. Larger than the 4.5mm the ball band calls for, but smaller than the 9mm the Yarnharlot recommended. 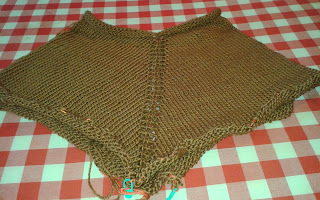 But - with the same number of stitches cast on, the poncho now became way too small. Hard to get over the head and not wide enough to fall over my shoulders. - and I am almost there. I estimate two more inches of plain knitting, then the Fern Kerchief lace pattern just before the cast off. Canada's first long weekend of the summer starts Friday. Almost as one, the nation heads for cottages and campgrounds spending time huddling in frozen massess beside campfires or in tents in what we teasingly call, the great outdoors. This year, we are no exception. Today we leave for our trailer near Hearst. No fun and frivolity for us though as we are headed up north for a funeral. 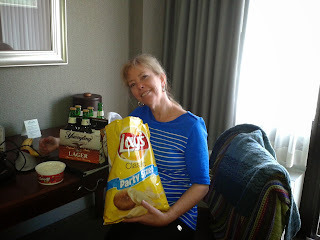 Our daughter-in- law's Mother passed away in January. What with unpredictable winter weather, iffy winter driving, and many of the family being at their winter homes in Mexico and/or Florida it was decided to have the celebration of life on the May 2-4. Coming so soon after my road trip to Baltimore I started thinking about how many hours of my life I have spent in a car driving somewhere. More than I'd like to count. Except for the fact that it always gives me lots of knitting time. And what's in my knitting bag this time? Well, at the bottom is the yarn for the third attempt at the failed Maryland experiment. 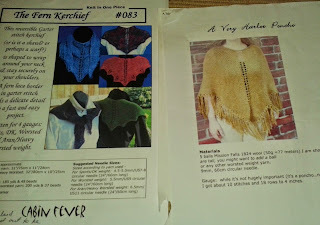 Before I get to that , though, I hope to start and finish a short poncho cover up. I have a back shirt/skirt summer ensemble which has a touch or rust at the skirt hem. Black is so not my colour, but rust looks good on me. Clever fashionista that I am, I hope to knit something in rust to wear close to my face. As they say in decor land, to echo the touch of rust at the hem. I spent much time this week, sketching out the best shape for a little cover up and have decided that it needs a point. Not a circular swing, not a squared-off bottom but a point. Poncho style. 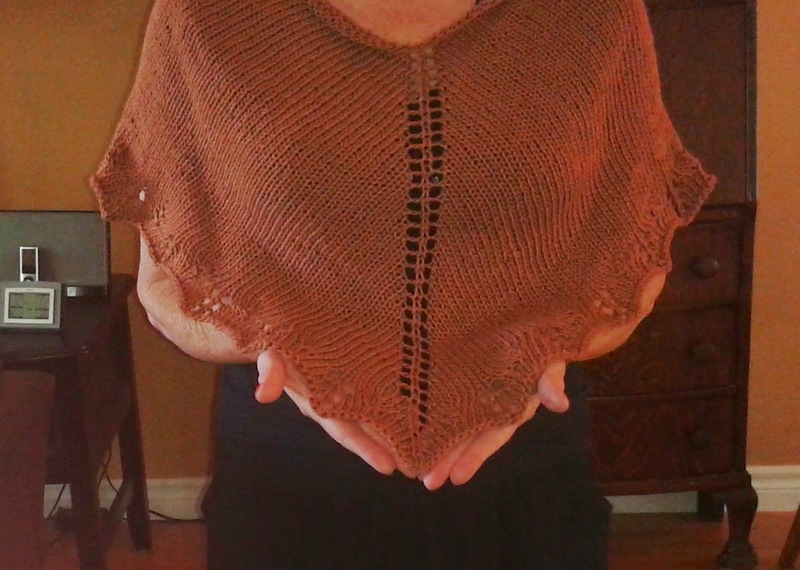 I'll use the Yarn Harlot's Poncho pattern as my guide. But mine will be shorter, falling just above the waist. And mine will not have fringe. Instead I hope to be able to work out the stitch numbers in order to use the lace bottom edging from Fern Kerchief. AND I hope to have it completed by the time we return Tuesday night. We'll see how that goes. You all know how that will go. In the mean time, have a great weekend. Enjoy the first long weekend of the summer. Hah. Post winter at least. 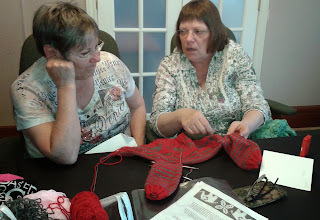 A more accurate title might be - Did Brenda Knit? 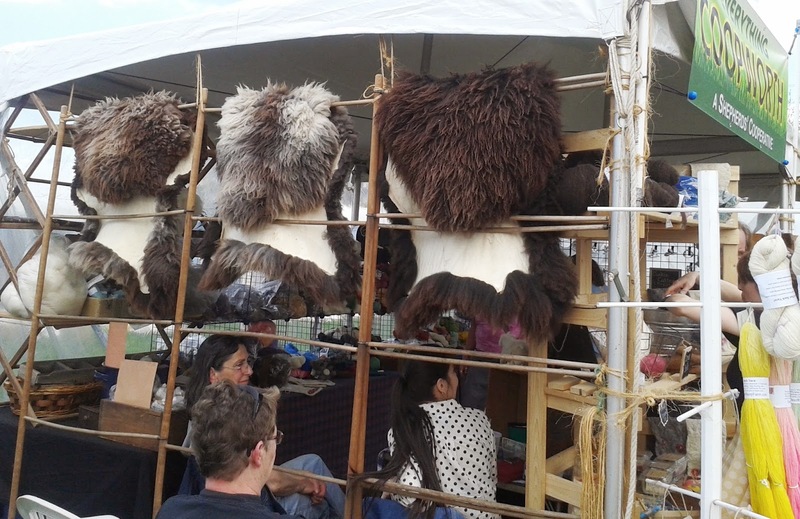 One would think with 25 hours of sitting in a passenger's seat, to-ing and fro-ing from the Maryland Sheep and Wool Festival that indeed I could have knit a sweater, a pair of socks or two, a baby's outfit etc.,etc.etc. But no. Here is what I accomplished sitting in that seat. Would it help if I told you it was the second attempt? The first being about as long as this second try before I ripped it back? No? Didn't think so. This is supposed to be an Eyelet Cardi look-a-like. I've made Chic Knits Eyelet Cardi in the past and it worked out well. I wear it lots. But I wanted top-down this time. So I thought - "Hey, I can do that." Just add the eyelet part to a normal, worsted weight, top-down, vee neck cardi. But so far, things have not being going well for me. The first attempt was too small. This attempt, the fit is fine, but, I don't like the squared, pointy corners where the neckline starts to head down into the 'v'. I see attempt number three in my future. In the mean time, back at home, I picked up 'Sheer' again. It is moving along quickly. 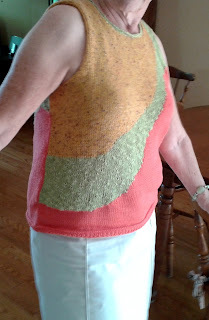 The back is finished and the front is almost at the neck shaping. No, you are not seeing things. The front chart is somewhat different than the back chart. With three different colours in this 'Tee' it will either be a 'goes with anything' or 'goes with nothing I own' summer tee. Of course, I'm hoping for the former. 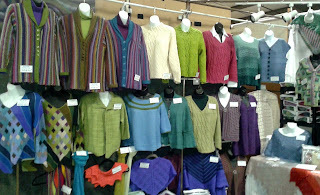 A pitiful amount of knitting for the couple of weeks that I have kept you all in blog, desert-land here at Brendaknits. And, yesterday was my annual test. 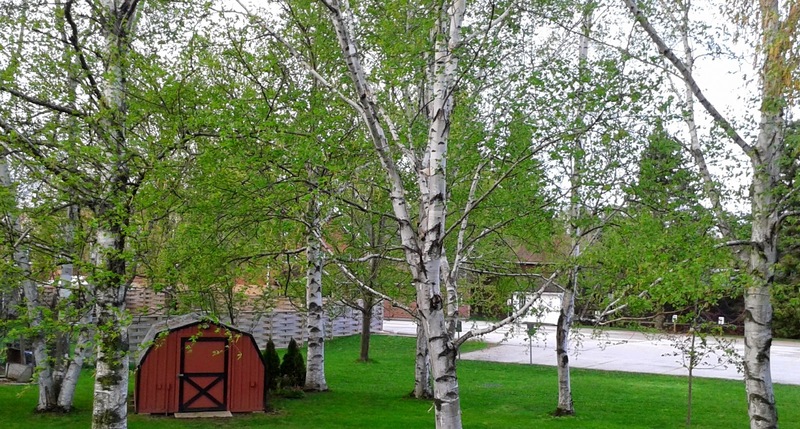 In 2006, a year of an early spring, on May 11, the day we bought our house, Fred stood at the patio doors and asked the realtor "What is that building back there?" This year, 2015, can we recognize the building behind us for the Church it is? Yes I think we can. Are the leaves as full as they were in 2006? No, I think they are not. Spring just failed my annual test. But as true Canadians might say "Well, at least it's not snowing." 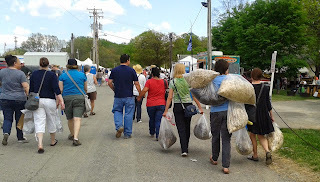 "When last we heard from Brenda, she was about to depart for the Maryland Sheep and Wool Festival", so begins today's blog post. Home since last Tuesday, I have had a busy time here as well. 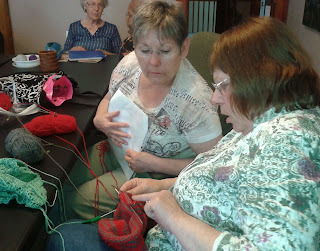 Knitting with my Ladies With Balls on Wednesday and the Meaford Knit Group on Thursday. A library-sponsored Mothers' Day Tea on Friday, a Jennifer Potter Concert on Saturday and a collapse day on Sunday. I leave you with a pictorial of the events. 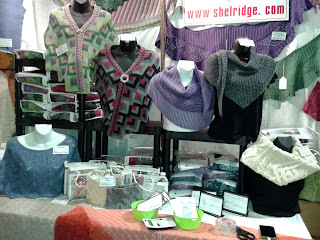 Our booth, ready for opening day. Festival Sights - sorry Needles - I didn't get out of our booth until 3:30 Sunday afternoon and by that time had completely forgotten to look up your friends. Our booth neighbours and their CanCan-like feet display, ready for hand knit socks. 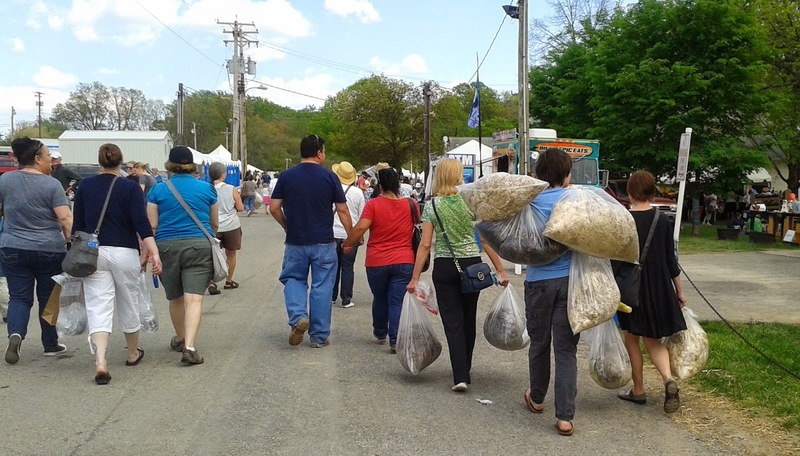 Bags of fleece going home with a happy customer. 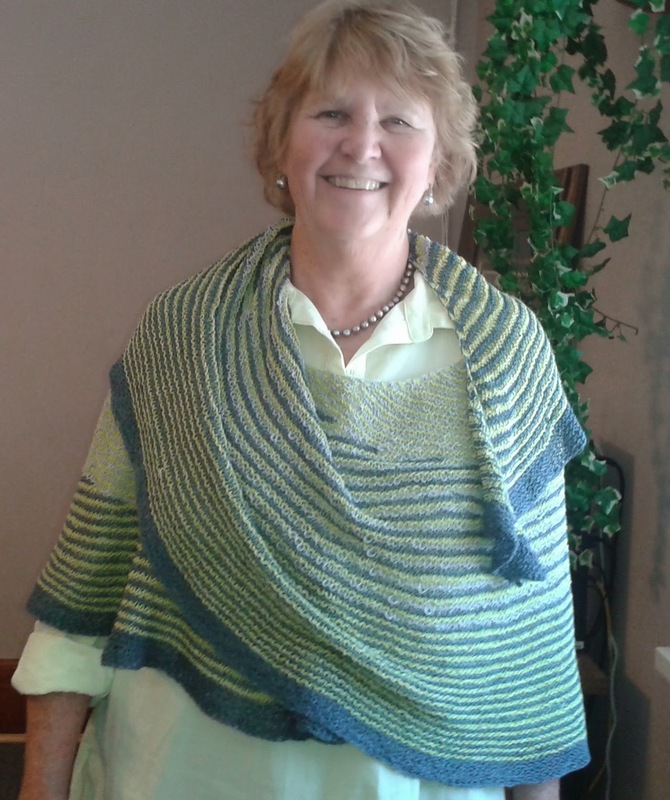 Carol's funky & fun, 3 scarf sweater. Sandy's Color Affection. Or is that Affliction, Sandy? 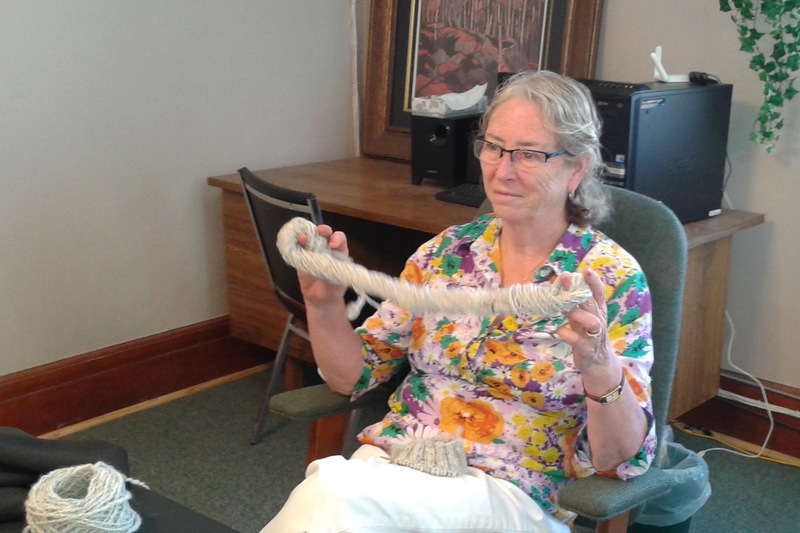 Another great use for the loopy yarn. 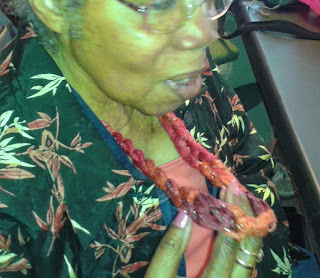 She had spent the morning at the school teaching 7 and 8 year old children how to make these necklaces. 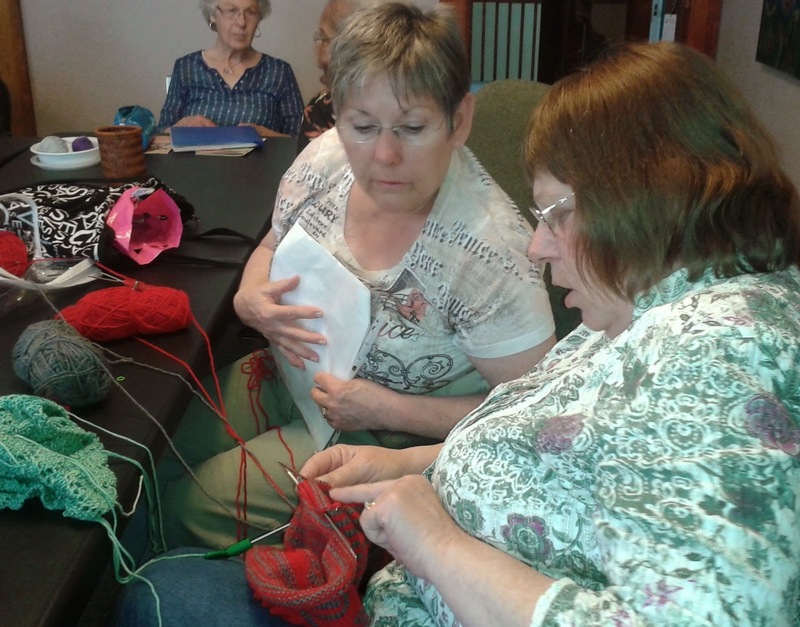 Tomorrow, the returning saga of "Did Brenda knit?"